A good news, There is a new site on the net : DavidandGillian.net. Lots of great pics, you have to go and visit !!! The building is located in the heart of Paris, in "Le Marais". Small quiet court, workshop of painting behind the panes! Here are pics taken this afternoon !! Too bad I'm 5 months late. I hope you will like what you find here !! I hope all is well for you all and that you had a happy Christmas ! I'm still working on my site. and sound clips are working. 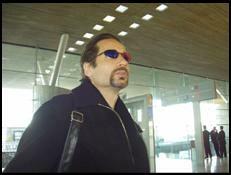 I'm working right now on the review of my little encounter with David at the airport in Paris in November 2003. This month of November 2003, I'm creating my David Duchovny's website. I won't do what everybody does on the Internet, that's not worth it. You can find, on the left, the links of my favourites sites !! The Man and the pics I took each time. This site isn't finished yet and there are links which don't work. 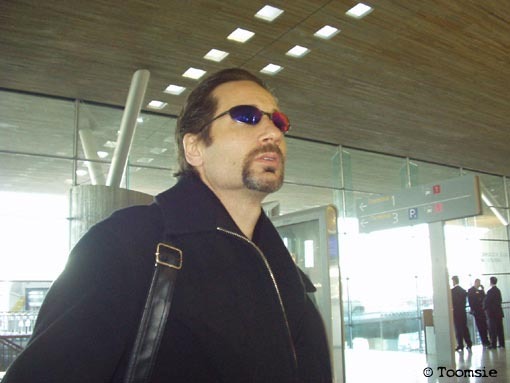 To do so, here's a pic of David at Paris airport on November 7th 2003.